Just one example of spam based on whois records. We all know that people mine whois databases to sell stuff. It’s incredibly cheap and easy to do these days: compare the zone files, get the new registrations, and then run whois lookups. There are even people selling the entire .com whois database for a few hundred bucks. This makes it easy for people to spam new domain name registrants and sell them services they don’t need, like search engine submission. The email was sent through Amazon.com’s Simple Email Service from support@searchrankingtools.net. Although one of the links in the email is masked as DomainServicesOnline.org, clicking any link sends you first through SearchRankingTools.net and then to DomainServicesOnline.org. If you call the phone number on DomainServicesOnline.org, a voice recording tells you to email @domainservices.org, which appears to be an identical site. All three of the domain names I’ve mentioned use whois privacy. However, SearchRankingTools.net has a nameserver of NS1.NATIONALWEBSERVICES.ORG. There are only five sites hosted on that nameserver, and the domain name itself doesn’t use whois privacy (although the phone number is invalid and the address matches a UPS store). If you just type in SearchRankingTools.net without the referrer code in the email, if forwards you to SearchRankingTools.com, a domain name owned by Frank Schilling. I suspect the owner of the .net is doing this to cover his tracks. On the one hand, this is an example of someone using whois privacy to cover bad behavior. On the other hand, if I were to use whois privacy on my domain registrations, this type of spam can be blocked at the whois privacy provider’s level. No, this has nothing to do with that. I don’t use their whois privacy. OK. How much later did the spam arrive? I typically get a range of such emails related to the issue with the WHOIS privacy within 2 days of registration. There is another wave of emails that is sent at any time for existing domains. That wave arrives from ‘acceptance716.com’ or verificationNNNN.com’ etc, which are sent from China. Best way to block these is at server level. It was a couple days. I also get these at other registrars. 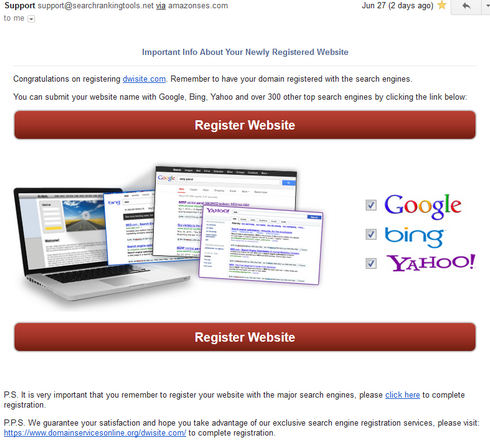 I get about 10-20 spams per day related to domain registrations. from fake invoices to people wanting to design websites/seo/logo/etc. personally i see this as just what comes with using public whois. i don’t really care, it doesn’t bother me. 90% goes straight to the spam folder anyways. personally i rather deal with the spam than have whois be restricted access. if webhosts would be more vigilant in dealing with spammers it wouldn’t even be an issue. True. But diggers like this should take a long walk off a short pier. Andrew, you should ask Frank about this when you and him are on Domainsherpa.com together. I’d like to see his face light up when you ask him. I’m sure he’ll claim innocence and say that he will look into it. Sad to see a registrar pilfering their own customers. What do you mean? It has nothing to do with uniregistry. Ahh, misread the part where it auto forwards the dot com extension. I got spammed via Whatsapp recently… just after getting a new domain name. Definitely from whois data (never use privacy) A web designer in LA. Keep meaning to call them back, prices looked good… 😉 High quality spam! I got this same email after registering a new domain name with GoDaddy. It reminded me about the first scam I fell for online, knowing nothing about SEO at the time. Basically, this company is farming unsuspecting Web clients by offering their service to any and every person who registers a domain. They do not have your best interest at stake and target (indiscriminately) anyone who registers a domain. Do your research and when possible, contact a local web developer to help you succeed with your web presence. This company is the web equivalent of some sleazy door-to-door vacuum salesman. PASS!